With a beautiful entrance way complete with a Koi pond, the restaurant was spacious and comfortable. 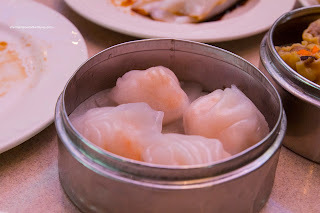 We started with the Haw Gow (Shrimp Dumplings) which were very small with a chewy wrapper. The shrimp filling had a slight snap but was on the rubbery side. It was predominantly seasoned with salt with little in the way of any sesame oil or white pepper. 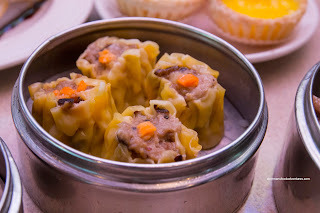 The Sui Mai (Pork & Shrimp Dumpling) was not very good as the texture was far too soft and mealy. At the same time, the chunks of meat were dry and chewy which created a strange feeling when eaten. Again, the main seasoning we could taste was salt. 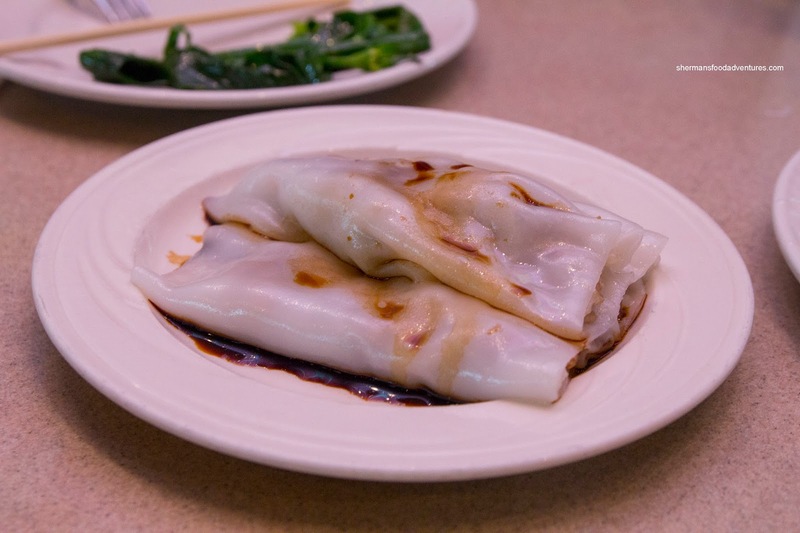 Up next, we tried both the BBQ Pork Rice Noodle Roll and Beef Rice Noodle Roll. We liked how the noodle itself was quite thin. It was relatively soft while being chewy at the same time. The BBQ pork filling was meaty exhibiting minimal fat. In that sense, that was a good rice noodle roll. As for the beef, it was too soft where it merely blended in with the rice noodle. Furthermore, it was quite bland, but the sweet soy sauce helped alleviate that somewhat. My son actually enjoyed the BBQ pork rice noodle roll and ate most of it. 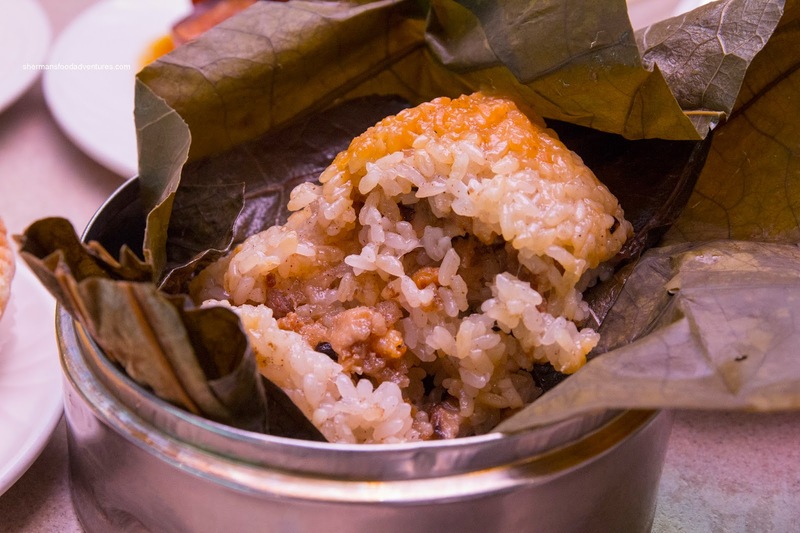 He also liked the Lo Mei Gai (Sticky Rice wrapped in Lotus Leaves). It was a tad wet, yet benefited from the ample amount of dried shrimp which added both flavor (saltiness) and aroma. Looking like it had a suntan from the hot Florida sun, the Seen Jook Gewn (Bean Curd Skin Rolls) exhibited a chewy exterior. The color was probably due to old cooking oil rather than being result of over-frying. The ground pork filling was on the drier side and chewy. On the other hand, it did taste okay with a good amount of wood ear mushrooms and bamboo shoots. 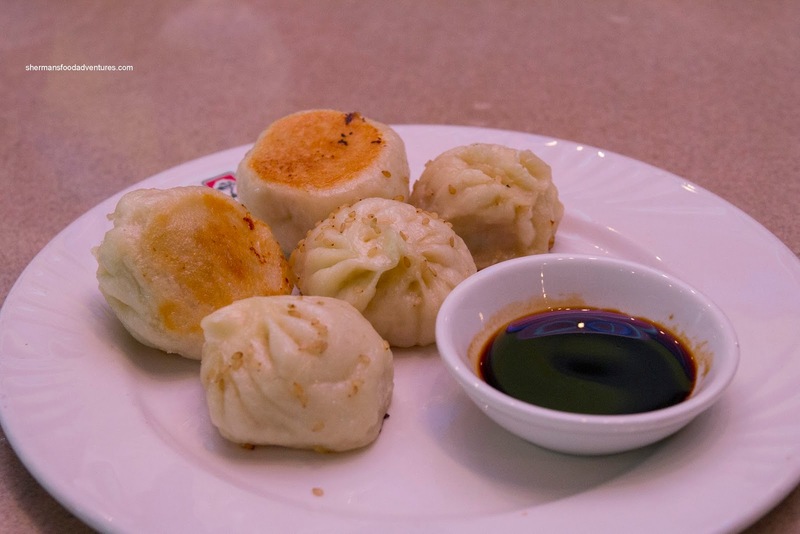 We weren't huge fans of the Pan-Fried Dumplings as the wrapper was far too thick and doughy. Furthermore, the bottom of the dumplings were not crispy despite the pan-frying. 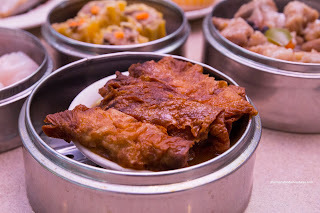 The pork and vegetable filling was too soft with barely any meat texture. To top it off, the accompanying sauce should have been red vinegar, instead it was sweet soy. On the menu, there was a weird item called "Beef Chop" which didn't match the picture. 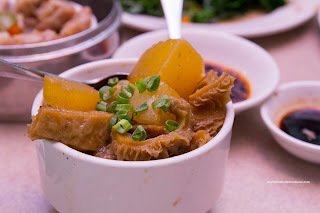 To me it looked like Beef Tripe and Daikon... and indeed it was. Then it occurred to me they did a phonetic translation (but it was still wrong because it would be assorted beef offal instead of just tripe). I found the tripe to be soft while still retaining a chew. It was properly cleaned where there was no gaminess. Rather, there was a pleasant gingeriness to the dish. 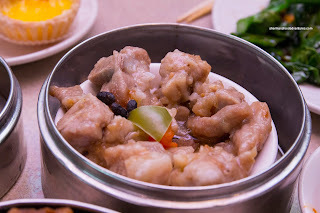 The Steamed Pork Spareribs were pretty decent except that there was far too much fat and cartilage. There was a good balance of flavors including a good amount of garlic. 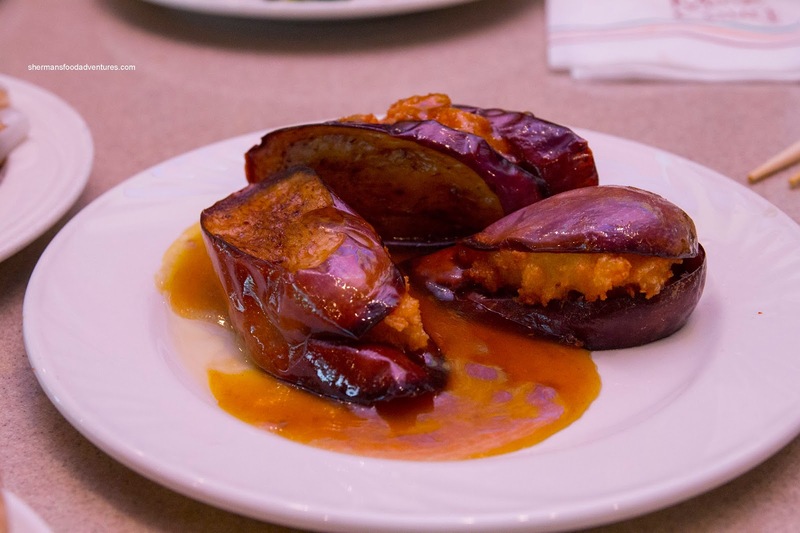 Our last savory dish consisted of the Stuffed Eggplant with shrimp mousse. The eggplant itself was fried crispy while being tender inside. The mousse was not as bouncy as I would've liked and the black bean sauce was pretty bland (not sure if there was actual black bean in there). 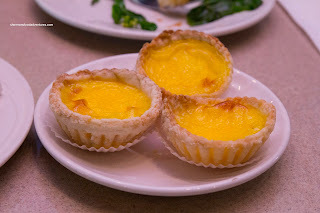 For dessert, we tried the Egg Tarts and they were too buttery. Moreover, the custard was floury rather than silky as well as being too sweet. 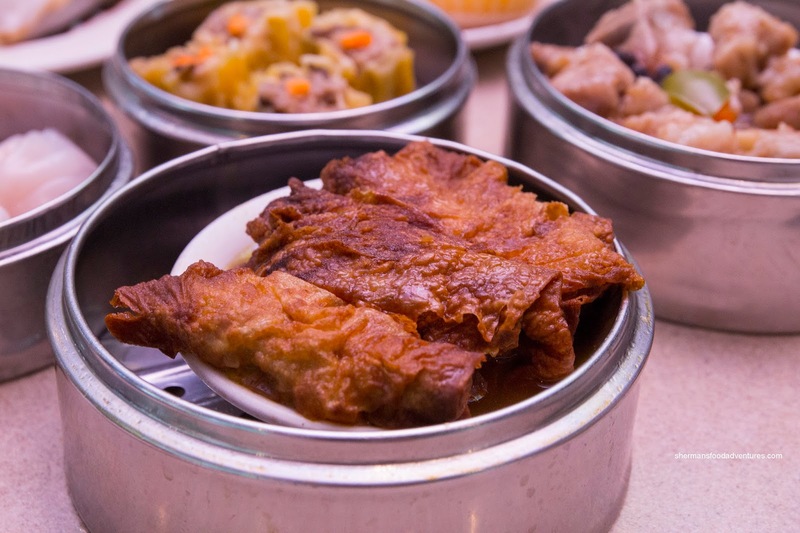 Now to be fair, we can't possibly compare this with some of the very best Dim Sum I've had. 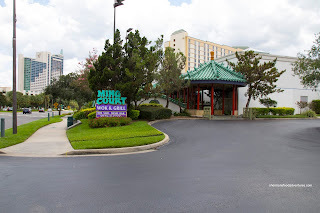 While we were heading out of the restaurant, an Asian tourist from Georgia asked us if the food was any good. We remarked it was pretty average and the response we got was, "it will probably be better than what we get back home". I guess everything is relative. next time you should drop by Golden Lotus nearby on John Young and Sand Lake, great chinese and dim sum menu.